‘You’re like Mickey Mouse, he has two ears, two eyes and one mouth, use them in that proportion’, a memorable piece of advice from my first ever Sales Manager. 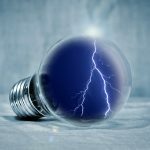 What this Sales Manager quite rightly highlighted was the importance of putting the potential customer’s challenges and needs at the heart of any sales conversation. Whether you lead on the front line in the sales engagement or are responsible for coaching your team, you’ll understand that it takes the right combination of discussion and listening to move that sales conversation towards success. There are of course many different attributes that make a sales person successful. The latest article ‘Seven Personality Traits of Top Salespeople’ by Steve Martin, recently posted on the Harvard Business Review, equates asking questions to curiosity and suggests that there is a high correlation between sales people demonstrating curiosity and achieving success. The best sales people don’t shy away from asking the difficult and uncomfortable questions. Throughout my career I have continued to advocate and coach my teams into asking questions, rather than leading with a pre-prepared pitch. There is a strong correlation between the focus of the questions asked and achieving a positive outcome. I’ve been greatly influenced by Dale Carnegie’s book “How to Win Friends and Influence People” and the central advice he gives is that to be successful you should ask questions which people enjoy answering. 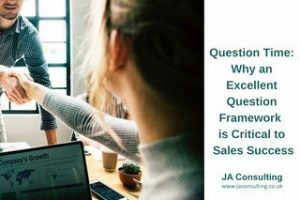 Here at JA Consulting, we focus on not only the importance of effective questioning but also the steps you need to take to be able to ask the most challenging questions. To earn the right to ask these types of questions, you must first go through a line of questioning that gets you to this position - you cannot launch straight into them. 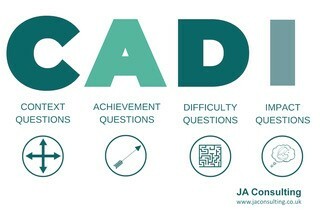 Over the years we have developed a questioning framework called CADI (Context, Achievement, Difficulty and Impact). CADI is a structure that helps sales teams plan exactly how they will navigate sales calls and pitches as well as the focus of the questions they should ask and when. These four types of questions become increasingly more challenging and ultimately more powerful as the conversation progresses. Context questions are the easiest of all four. They are background questions which help you identify more information about your prospect’s current situation. Example: How many offices do you have? How big is your team? 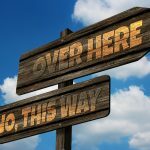 The challenge is these questions are not very persuasive – and they’re pretty boring for the prospect! Achievement questions help you get to the issues which the prospect is looking to solve or overcome. Example: What’s really important to you? What are your goals? What are you really looking for …? These questions allow you to discuss more specific details about the challenges they face and help you to identify potential solutions. Example: Are you happy with the current lead times? 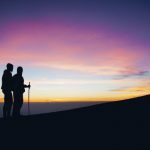 What barriers are in the way of achieving ….? This is an opportunity to use the information gathered to identify the causes and effects (current or potential) of problems and needs perceived by the potential client. Example: What impact does a 60-day lead time have on the market? What are the consequences of down time in a 2-week production process? By asking more probing questions focused on Achievement, Difficulty, you will achieve more impact with your final questions. 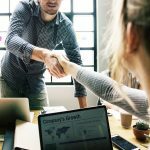 Having the confidence to ask these types of questions instead of leading with a pre-prepared pitch, demonstrates that you have a genuine interest in the prospect with whom you are talking and done well, can create a climate in which you can co-create a solution to their specific business problem. Achieving this will put you in the best position to close the deal. About Chris Smith - Chris is passionate about the delivery of excellent customer service. He has over 30 years of winning and delivering innovative technology solutions into a variety of different industry sectors often working on high profile transformational projects for companies like First Group, GSK, Royal Mail, Serco, G4S, Cardiff Council and HMRC.